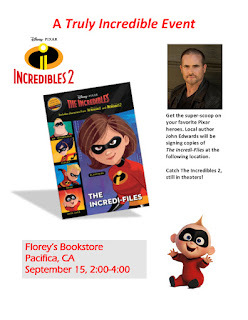 Florey's Book Co.: The Incredi-Files - Book event with author John Edwards, Sept. 15th at Florey's! 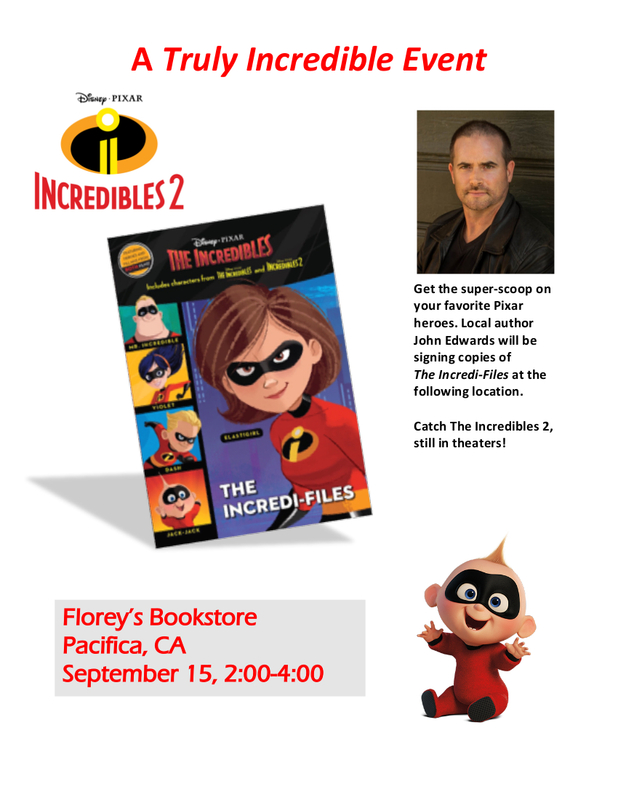 The Incredi-Files - Book event with author John Edwards, Sept. 15th at Florey's! Florey's Books welcomes local author John Edwards as he discusses his book, "The Incredi-Files". An exciting hardcover character and vehicle guidebook featuring heroes, villains, and vehicles from Disney/Pixar The Incredibles 1& 2! The Incredibles 2 brings back everyone’s favorite family of superheroes in an exciting, hilarious, and heartfelt super-sequel. This new chapter sees Mr. & Mrs. Incredible, Violet, Dash, and Jack-Jack encounter a brand-new nemesis who puts their powers–and their family–to the ultimate test! Children ages 8 to 12 will love this 64-page full-color character and vehicle guidebook based on the Incredibles franchise. After graduating from Carnegie Mellon University with a master’s degree in professional writing, author John Edwards packed whatever would fit into his Corolla and made the trek from Pittsburgh to Hollywood. Since that fateful decision, he’s played numerous roles from production assistant to location manager to studio executive (assistant). He’s even been a farm hand in downtown Los Angeles, writing all the while. He has written books for Walt Disney’s Princess and Planes franchises; episodes of Tom & Jerry for Warner Bros. Television Animation; and videos and books for ABCMouse.com.